If you are looking for a way to break into the food industry, a food truck offers a lower cost alternative to a traditional restaurant. A traditional brick and mortar restaurant, location, menu, and marketing are all integral parts of a successful food truck business. While it might be tempting to park your food truck wherever there’s a crowd, it’s important to check local permits and zoning laws first. While in the past, food trucks have been associated with simple fare-like sandwiches or burgers, today’s food truck menus have exploded in variety, offering everything from gourmet cupcakes to wood-fired pizza. Food trucks have revolutionized marketing, taking advantage of social media sites such as Facebook, Twitter, and Instagram to reach customers in new and innovative ways, while also building brand awareness. One of the biggest advantages a food truck has over a traditional restaurant is that it brings the food to the customers. However, because of restrictions and licensing, a food truck can't just set up shop wherever there are crowds of people. Most towns and cities require that any food truck vendor applies for special licenses and permits. That's why it's important to first find out if an area allows food trucks. Sometimes the number of permits allowed in one area is capped, causing a long waiting period for food truck owners. Today’s restaurant food trucks offer a wide range of cuisine and while sandwiches are still on the menu, customers can find more imaginative fare such as gourmet cupcakes, sushi, or wood-fired pizza. As consumers seek healthier food options when dining out, food trucks are adapting their menus to feature more organic, locally grown ingredients. For example, Lulu’s Local Eatery in St. Louis, Missouri has built a thriving food truck business using locally grown herbs and produce from area farms. Blenders and Bowls food truck, operating out of Austin, Texas, specializes in organic açaí bowls topped with hemp granola, fresh fruit, and a drizzle of honey. Many mobile food trucks are skipping websites altogether and using social media as their only means of advertising and marketing. Sites like Twitter and Facebook allow food trucks to post their daily or weekly location, while Instagram offers a platform to showcase menu items and daily specials. Utilizing mobile technology allows food trucks to connect with customers no matter where they are. Food trucks can advertise their location, as well as continually engage with customers through tweets, shares, and posts. 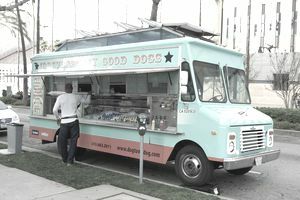 Social media is also an excellent way to shape a food truck’s voice and brand, building a stronger bond with customers. A bonus of social media is that it's free. Food trucks offer a budding entrepreneur the opportunity to break into the restaurant industry on a shoestring budget. Once pigeon-holed as fast food on wheels, today’s food truck concepts include many different types of global cuisine, with a growing emphasis on healthy food options. Thanks to social media, food truck owners can connect with customers on a personal level, anywhere, any place without a pricey advertising budget.